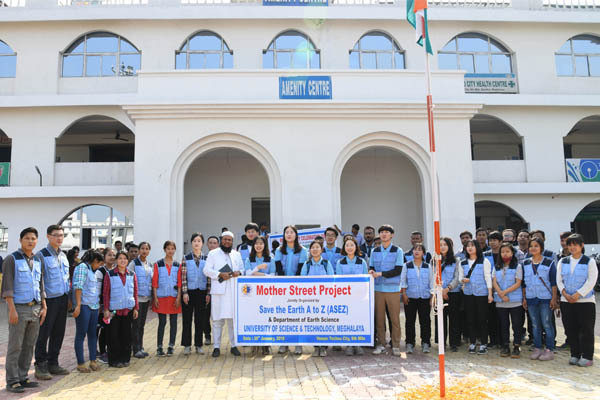 On Republic Day of India, January 26, the International Volunteer Group named ASEZ which means Save the Earth from A to Z consist of the member of World Mission Society Church of God university students was invited on the event of Republic Day of India in USTM. The event started with the greeting of USTM Chancellor, Mahbubul Hoque while a member of ASEZ introduced the meaning and motto of ASEZ. After that, ASEZ and USTM students carried out Mother’s Street Project to improve local environments and welfares standards and to change 40,000 km, the circumference of the earth. The activity had proceeded painting the trees as well as cleaning. Among the students, they were separated as two parts, cleaning and painting. The cleaning team mainly cleaned the drain which had a large amount of garbage along the Mahatma Gandhi Road in USTM. The painting team painted the trees on the roadside with limestone. The cleaning campaign which they had done is meaningful activity held on Republic Day of India. And Mother’s Street Project was a good chance to raise USTM students’ awareness and implementation ability about the environmental matters. For clean India, for clean all over the world, ASEZ and USTM students will never stop their efforts to change the world with Mother’s Love.